Watch out! The rats have escaped from the lab! 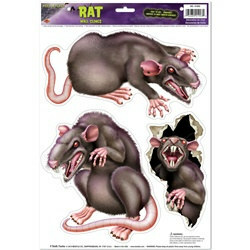 Put the Rats Peel N Place on your walls to freak out your guests. These large stickers go on most smooth, clean walls and are easily removed without damaging the paint. If you place these larger than normal Rats Peel N Place near the floor, your guests might just think they are real and let out a horrifying scream. Most children will more than likely be frightened by these, so if you are planning a Halloween Party or are building a haunted house, these are a perfect addition. Some other great wall stickers for Halloween are the Creepy Eyes Peel N Place and the Trapped Ghoul Peel N Place. Start preparing for Halloween now if you want it to be an unforgettable one. I loved these peel n place rats! They look awesome and so realistic!